A baby monitor is something that almost all new mothers want. It's not meant to take the place of personal monitoring of the baby but it's another thing that can reduce stress in a new mom's life. 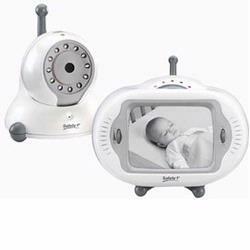 There are many different makes of baby monitor to choose from. Some are just basic sound monitors and some come with high tech Video monitoring. Some are set up so that you can talk to or soothe baby from another room and with some monitors you can remotely trigger soothing music for baby. There are many well known companies that make baby monitors. Here is a list of some of them. The cost is usually between $20 to $250.Depending on what's needed. If you click on the pictures below you can see some that we think are reliable and good value for money. If you live in a large house with many floors or if you expect to monitor baby from the garden you would need a baby monitor with a longer range than if you live in a small single family home. A baby monitor lets mum know what's happening in baby's room when mum is not there. Video is good but the most important thing is clear sound.